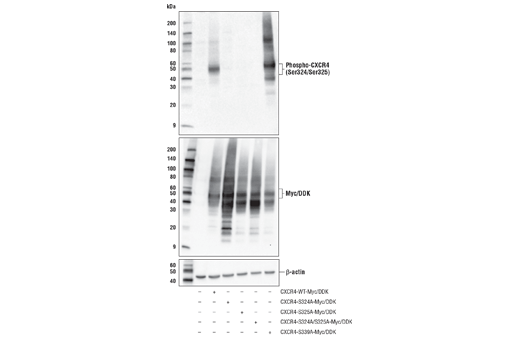 Western blot analysis of extracts from 293T cells, mock transfected (-) or transfected (+) with constructs expressing Myc/DDK-tagged full-length human CXCR4 wild-type protein (CXCR4-WT-Myc/DDK), Myc/DDK-tagged full-length human CXCR4 S324A protein (CXCR4-S324A-Myc/DDK), Myc/DDK-tagged full-length human CXCR4 S325A protein (CXCR4-S325A-Myc/DDK), Myc/DDK-tagged full-length human CXCR4 S324A/S325A protein (CXCR4-S324A/S325A-Myc/DDK), or Myc/DDK-tagged full-length human CXCR4 S339A protein (CXCR4-S339A-Myc/DDK), using Phospho-CXCR4 (Ser324/Ser325) Antibody (upper), Myc-Tag (71D10) Rabbit mAb #2278 (middle), and β-actin (D6A8) Rabbit mAb #8457 (lower). Western blot analysis of extracts from MOLT-4 cells, untreated (-) or treated (+) with combinations of the folowing treatments as indicated: CXCL12 (100 nM, 10 min), λ-phosphatase, using Phospho-CXCR4 (Ser324/Ser325) Antibody (upper) and β-actin (D6A8) Rabbit mAb #8457 (lower). Phospho-CXCR4 (Ser324/Ser325) Antibody recognizes endogenous levels of CXCR4 protein only when phosphorylated at Ser324 and Ser325. 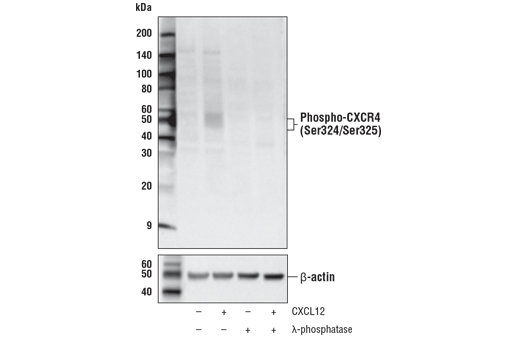 This antibody does not cross-react with CXCR4 protein when phosphorylated at Ser339. Polyclonal antibodies are produced by immunizing animals with a synthetic phosphopeptide corresponding to residues surrounding Ser324/Ser325 of human CXCR4 protein. Antibodies are purified by protein A and peptide affinity chromatography. CXCR4 is rapidly phosphorylated at Ser324 and Ser325 by protein kinase C and G protein-coupled receptor kinase 6 upon treatment of cells with CXCL12 (2). Phosphorylation of CXCR4 at Ser324/Ser325 is critical to the ubiquitination and degradation of CXCR4 (6,7). Marchese, A. and Benovic, J.L. (2001) J Biol Chem 276, 45509-12. Bhandari, D. et al. (2009) Mol Biol Cell 20, 1324-39.